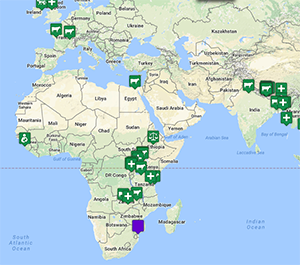 The Post Graduate Certificate Program in International Veterinary Medicine is a unique opportunity for students at Cummings School of Veterinary Medicine to prepare for an international career. This is a structured, comprehensive, student-driven program which augments the DVM curriculum and is completed in parallel with the DVM program. Whether a student's goal is to work hands-on in the field, or negotiate policy change at the international level our goal is to help students develop the knowledge, skills and agency they need to be competitive and effective as international veterinarians. Over the course of the program, students are expected to develop a level of knowledge and proficiency in general international veterinary topics equivalent to that of a veterinarian that has been working internationally for at least one year. Students may choose up to two areas of specialization in which they will develop expertise through self-directed educational opportunities and an independent international research project. Find out more about the requirements to obtain a Post Graduate Certificate in the IVM Program.